Inducted 2014. One number may best define Fox’s soccer career. That number would be eight, as in the number of losses QND suffered during her four years in the program. Twice in that span, the Lady Raiders went undefeated in the regular season, and in 2000, they set the school record for victories with 27 as they placed fourth at the state tournament. Fox, a 2001 QND graduate, was a physical presence in the midfield and helped the Lady Raiders post 54 shutouts from 1999-2001. 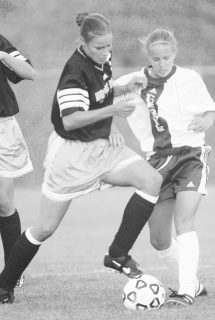 As a sophomore in 1999, she helped QND establish a school record for goals allowed with eight. As a senior, she earned all-sectional honors, Fox scored seven goals as a senior and five as a junior. Fox’s success wasn’t limited to the soccer field. She was a starter on QND’s Class A state championship volleyball team in 1998 and runner-up finishers in 1999. She totaled 195 kills and a team-high 123 blocks as a senior. She also was a reserve on the 1999-2000 girls basketball Elite Eight team and helped QND win 22 games as a senior when she averaged 12.2 points and 8.4 rebounds. In the regional championship game against Central, she had 21 points, 18 rebounds, 13 steals and 4 blocked shots. Fox was a four-year member of the women’s soccer team at Eastern Illinois from 2001-04. She helped lead the Panthers to four straight Ohio Valley Conference Tournament Championships and was MVP of the OVC Tournament in 2004, and the Panthers also made four straight NCAA College Cup Tournament appearances. She was a four-time first team All-OVC selection and a two-time All-Great Lakes Region third team selection. She ended her career ranked in the EIU top ten for goals (17), assists (15), points (49) and game winning goals (5). She was inducted to the Eastern Illinois University Hall of Fame in 2012. Fox lives in Quincy with her husband, Brian. They are co-owners of ABF Training.